Okay, I’m being a little melodramatic, but more on that later. When I went down to breakfast, an older British couple was already there and asked if I’d done the cooking tour yet. I told them that’s what I was doing that morning. Turns out, they were on my tour. Their names are John and Marian, and they are the loveliest couple ever. We had a wonderful time shopping and cooking together. They really are lovely people. The cooking class company sent a taxi for us and dropped us off near the market where our guide for the day waited. There were nine people in the class, eight Brits and me. Jen was our guide, and she took us through the market, where we bought all of the food we’d be cooking that day. There is no food at the school. 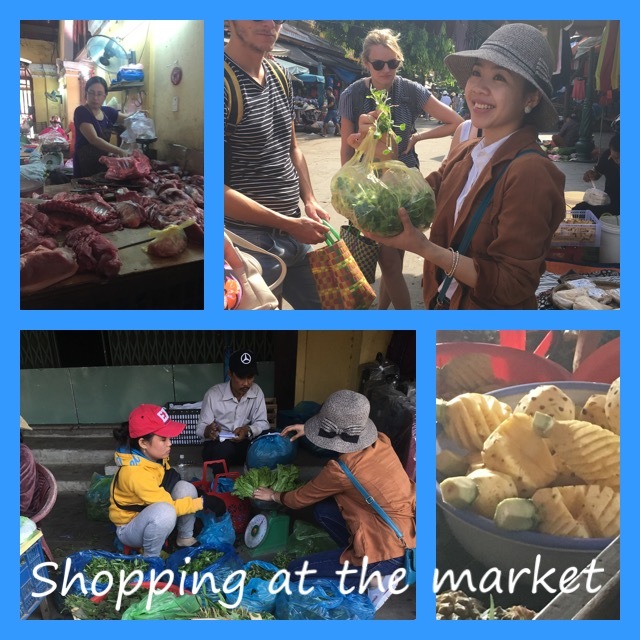 Jen gave us a wonderful tour of the market, explaining what we were buying, as much of it is either not common in the U.S. or not available at all. Some things don’t even have English translations. She is so sweet and knowledgable! 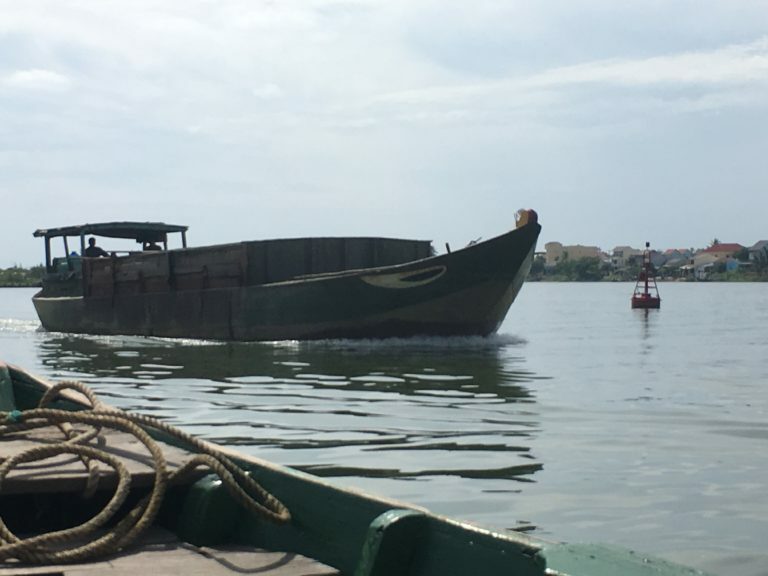 After shopping in the market, we took a boat ride down the river to the island. 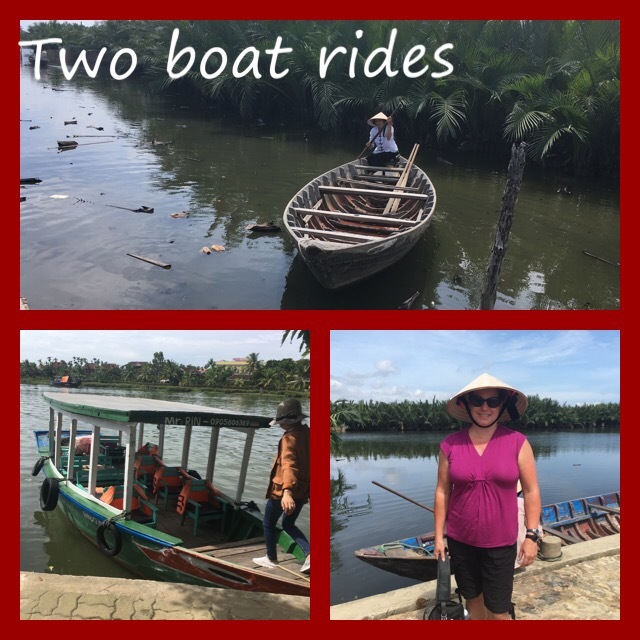 Once there, we put on the traditional Vietnamese hat and got into smaller boats, and a local paddled us through water coconut canalways to the school. So peaceful and relaxing! 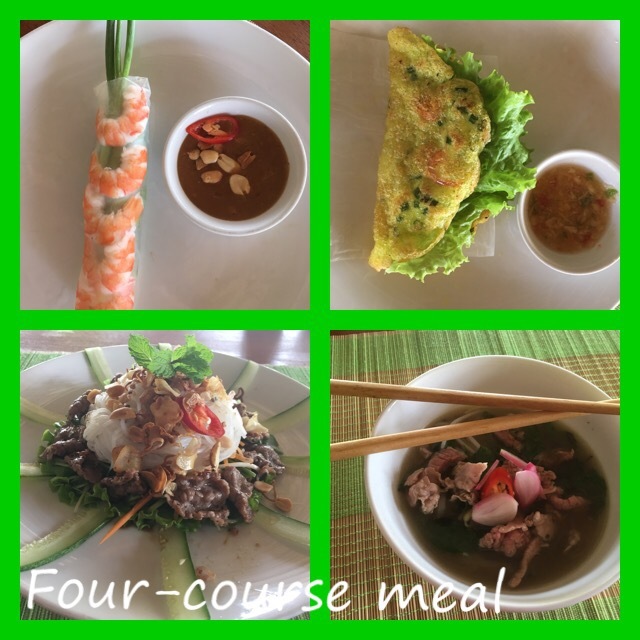 Once there, we made four Vietnamese dishes, which I posted on Facebook, but made a collage below for anyone not on Facebook. All of them were yummy, but the crispy, sizzling rice flour pancake was my favorite! We bought a ton of passion fruits at the market, and there was unlimited passion fruit juice all day. They just kept refilling it and refilling it! Very fun experience! Hoi An is famous for its tailors, and they can make anything from a picture for a fraction of the cost. I printed out pictures of a $500 Kate Spade dress that I want and brought them to Vietnam, and Bill took me to a famous Hoi An tailor before he dropped me off at my hotel the day before, where I gave them the pictures, we picked out the fabric and the lining together, and then they measured me. Took about 15 minutes because I knew what I wanted. I had an appointment for my second fitting after my cooking class, and it turned out that they will drop you anywhere you want in Hoi An, so they dropped me right off at the tailor! Very convenient, especially since I thought I’d have to walk there. After my fitting, I had to hightail it across town for my Bicycle, Boatride, and Sunset BBQ tour. Luong was my guide, and she was also very knowledgeable and sweet. Three other people had signed up to take the tour (prepaid), but they were no shows, so I had yet another private tour! Luong and I never ran out of things to talk about, so it was fun to have her all to myself. We hopped on our bikes and rode through Hoi An ancient town and some villages before we reached the countryside. And a rice paddy. And not 20 seconds after entering the paddy, my bicycle seat broke! Not so badly that it caused me to fall or anything, nor was it unusable, but I thought the timing was hysterical! It was rather uncomfortable for the remainder of the 1.5-hour ride (which included a bunch of stops). The thing is, I saw the guy fiddling with the seat before he gave me the bike, and I almost asked for a different one because I thought something might have been wrong with it. Oh well! It could have been a lot worse! 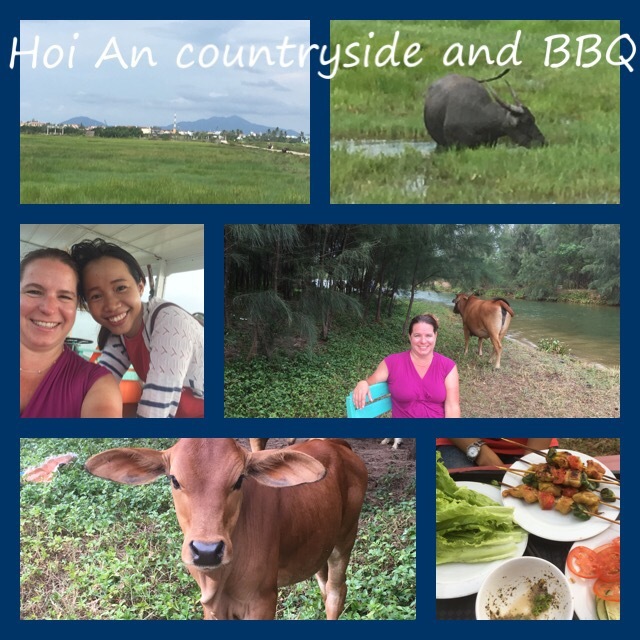 The countryside was beautiful, with mountains in the distance, and I learned a lot about rice growing, shrimp farming (Luong’s dad is a shrimp farmer), the lotus flower, Vietnamese cemeteries, and more. After the bike ride, it was time to hop on the boat to go back to Thuan Tinh Island (where my cooking class was) and have the sunset BBQ. Luong drove the boat, and I wondered why. Turns out the food for the BBQ was made by the boat driver’s wife, and he was in the back of the boat cooking it over a fire pit so the first course would be ready when we got to the island! Once there, we parked in a little clearing, and Luong and the driver unloaded a small table and two chairs, and Luong and I sat down to eat while the driver continued to cook each course. The first course was grilled shrimp, the second was grilled turmeric chicken, the third was pork kabobs, and the fourth was beef grilled to put in a banh mi sandwich made from the most delicious bread ever (and I’m not a bread person). I was stuffed!!!! There were cows nearby, and they came to visit as we were eating. A baby cow was very curious and came to within about a foot and a half from us! From the boat dock, we had a 2-minute bike ride back to the tour office, where I sadly said good-bye to Luong. I then headed back to the tailor for my final fitting apointment, to ensure the dress was done to my satisfaction. It was, and I was able to bring it “home” then. My hotel (which was a beautiful little villa) was quite aways from the city center, but it was a nice night and an easy walk, I needed to walk off that dinner, and I didn’t want to pay for a xe om (motorbike for hire) or taxi, so I made the 30-minute walk while taking in the sights and sounds of a Hoi An evening. It was my longest day, arriving back at my hotel just shy of 12 hours after I’d left it, so I decided to take a nice dip in the pool and go to bed (blowing off the blog in the process!). The hotel receptionist, who is probably the owner’s daughter as she was there from early morning to late at night every day, came to chat with me while I was in the pool. The Vietnamese are so friendly! Everywhere I’ve stayed, they’ve known my name and called me by it and know exactly when I’m leaving and what I need to get to my next destination. It’s amazing! So much fun!! Love all your post so far!! So I guess those rice paddies have it in for bicycles. 😉 I’m loving your adventures, Dana! Giggling about the bike mishap, but only because you weren’t hurt. I’m thoroughly enjoying reading about your adventures, Dana; you are obviously loving every minute and it shows! I knew rice paddies were bad luck! 😉 Sounds like an awesome day anyway, though! Thanks, everyone! I’m having an amazing time, rice paddy incidents and all! Giggle away, Laura! I certainly am! Stay clear of rice paddies! But boy does that food sound and look amazing. What a wonderful day, Dana! It really was, but they all have been!